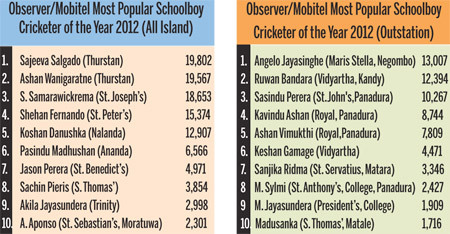 Sunday Observer Mobitel: Most Popular Schoolboy Cricketer of the Year Contest 2012. The close tussle for the first place between the two Thurstan College players Sajeeva Salgado (19,802) and Ashan Wanigaratne (19,567) kept on fluctuating in the (All Island) competition with Salgado taking over the lead with a slender majority of 235 votes at the end of count number 7 in the Sunday Observer/Mobitel Most Popular Schoolboy Cricketer of the Year 2012 Contest. In the Outstation category, too, there was a change as Royal College, Panadura’s Kavindu Ashan polled 8,744 votes to take him to the 4th place displacing school mate Ashan Vimukthi (7,809) to the 5th place. The leader in the Outstation contest is Angelo Jayasinghe of Maris Stella College with 13,007 votes and Ruwan Bandara of Vidyartha Kandy second with 12,394.